As a wedding coordinator, one of my responsibilities is to create the order of events for the ceremony and reception. In my experience, the ceremony is usually pretty straightforward - it's the reception that becomes a game of chess. 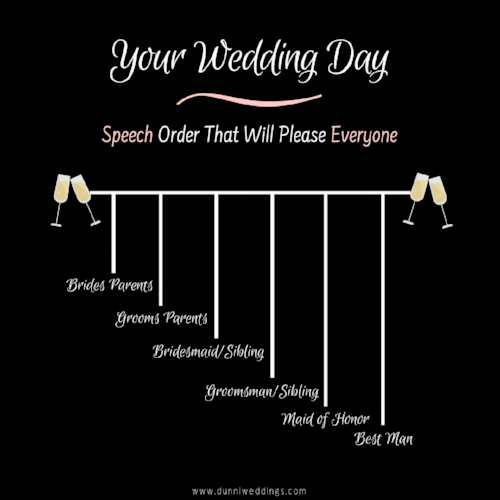 A common question is, "in what order should the speeches be given during the reception?" 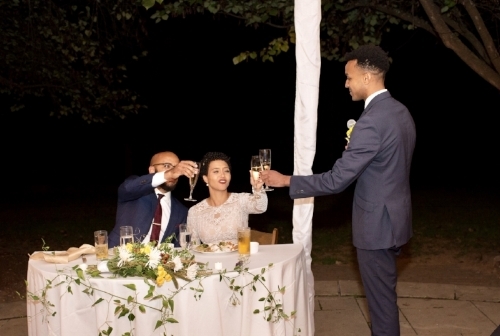 Have you ever been a guest at wedding, sitting at your designated table, listening to speech after speech after speech AFTER SPEECH - wondering when the MC will tell you it is time for dinner and FINALLY put you out of your misery? Please don't do that to your guests! It is torture (trust me, I've been to enough weddings to know!) So what is, you're wondering, a great way to spread out the speeches so that all the people you want can speak AND your guests won't make a mass exodus? Here's my suggestion and something I've seen work very well. 9. End of toasts and on to the next part of the reception program! Speeches spread out. Guests not waiting long for dinner nor sitting through 20 minutes of long drawn out speeches! Have you seen this work? What would you suggest for the order of speeches at your wedding or what have you seen work? Leave a comment below or email me at dunniweddings@gmail.com.